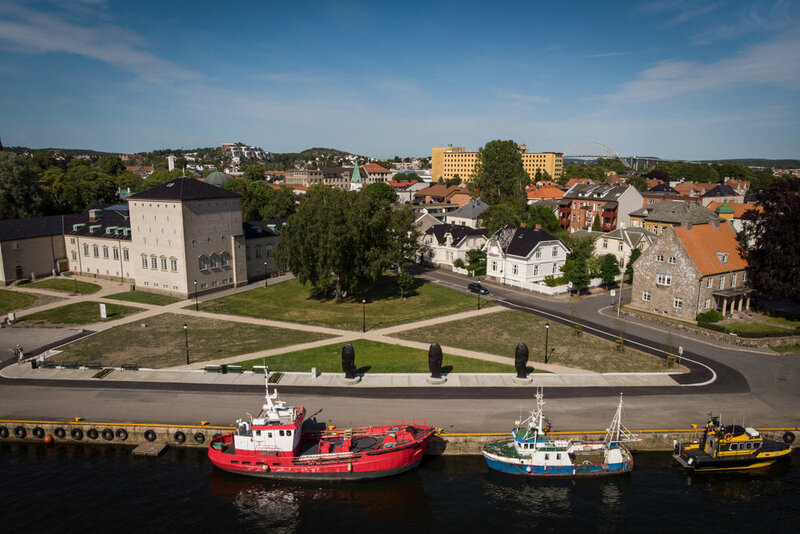 Three monumental cast-iron heads are standing at the quayside in Fredrikstad. The sculptures are made by Jaume Plensa. Three cast-iron heads are standing at the quayside in Fredrikstad. Their eyes are closed. The monumental size of the 4.5 metre sculptures contrasts with the peaceful, introverted expressions of the young women portrayed. The way in which the heads are stretched vertically gives them a floating, spiritual feel. Plensas three heads are modelled from real people. The shape is processed digitally before it is produced in cast iron, conceived especially for this location. – When Peer returns from his journey, where he has failed as a human being in many ways, he asks his wife Solveig ‘Where was I as the one I should have been, whole and true?’ Solveig answers: ‘In my faith, in my hope, in my love’. With these words he is set free. It's a strong message, and I've wanted to make an artwork based on Solveig for quite some time. It was really fitting to do this as my first project in Norway. – Although this is my motivation for the work, it's not necessary for the audience to know the story. Everyone is free to interpret it in his or her own way. Jaume Plensa was born and works in Barcelona. He employs various media and has made public artworks in cities all around the world. Best-known for his large sculptures of women’s heads, for many years he has been working on the idea of the feminine – which is not necessarily about women, but more about values and an attitude towards life. Famous works include the sculptural video Crown Fountain (2004) in Chicago's Millennium Park, and Dream (2009), a 20-metre-high head in white dolomite located in a former mining community outside Liverpool. Fredrikstad is located in Østfold county at the outlet of the Glomma river. Its strategic position by the water has given the city an important role, both military and economic, throughout history. Due to the importance of the water for the city, Plensa wanted a location by the river for his work. The quayside area called Phønixbrygga is an open site connected to the water. A former road and parking spaces were incorporated into an existing park to upgrade the area when the sculptures where placed there. The sculptures are revealed gradually to people approaching the pier from the city center or by boat. Plensa believes that it is important that art placed in public space helps to create good meeting places for people and that the public will be able to get close to the artworks.